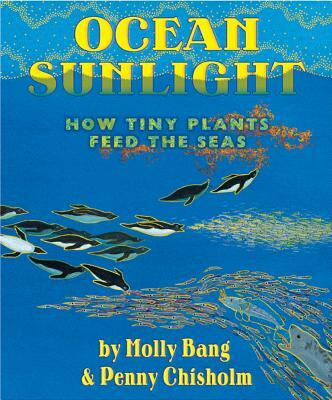 Ocean Sunlight: How Tiny Plants Feed the Seas by Molly Bang and Penny Chisolm. Grades 2-5. Scholastic, 2012. Unpaged. Review copy provided by my local library. Okay, y'all know that plants on land turn the sun's energy into food, which is eaten by animals to create the food chain. And you probably assumed that the ocean (such a massive part of the earth) also has food chains that start when plants catch the sun's light. But where are the ocean's plants? True fact: a billion billion billion teeny tiny plants live in the ocean and catch the sun's light, starting the ocean food chains. 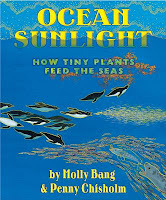 Ocean Sunlight is all about how these microscopic plants (called phytoplankton) contribute to the earth's environment. Not only do they feed animals in the sea, but they give off HALF of the oxygen we breathe every day! Bright illustrations help take the reader from the (relatively) warm surface waters of the open ocean to the darkest depths of the ocean floor. The text is precisely chosen to convey a big, giant concept in a way that's not overwhelming, while additional information is provided in the back of the book for curious minds. The authors explain how storms at sea and ocean currents help distribute nutrients throughout the sea and why it's so important to understand and take care of our oceans. This book expands on some of the concepts in Molly Bang's My Light and Molly Bang & Penny Chisolm's Living Sunlight, but it stands alone well. It would make an excellent addition to units on oceans, food chains, and the environment. For older readers, I'd pair this with Tracking Trash by Loree Griffin Burns for more on why we need to take care of our oceans. Ocean Sunlight is on shelves now! Happy Nonfiction Monday! This week's roundup is over at Practically Paradise, so make sure you check it out!